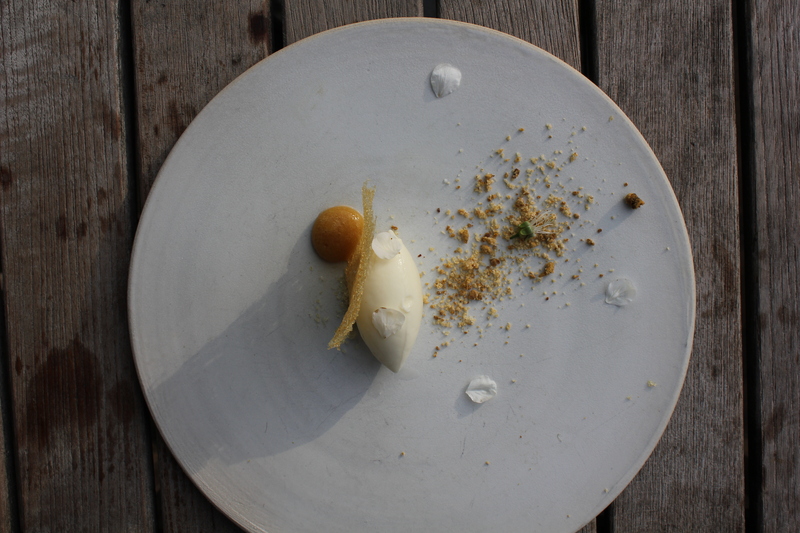 Today’s guest blog is by Josh Evans, lead researcher with Nordic Food Lab in Copenhagen. He will lead a workshop on insect eating at our October 17 Eating Through Time Festival. A version of this article was first published on the Nordic Food Lab blog. Honeybees (Apis mellifera) have mastered feats of chemical engineering as various as they are alchemical. Their most well-known substances are of course honey, their concentrated, stable, hive-warming energy source, and wax, their pliable, moisture-proof structural material. Yet there are other substances nowadays known primarily only to beekeepers and practitioners of traditional medicines. Propolis (or ‘bee glue’) is a structural sealant and potent antimicrobial agent within the hive, and it carries a beautiful resinous aroma. Royal jelly is what all brood—the immature larvae and pupae—are first fed before being weaned onto honey (unlike the future queen, who becomes differentiated by being fed only royal jelly). It has remarkable moisturizing, emulsifying, and stabilizing properties. Even the brood are used as food in many cultures around the world and have a delicate savoriness with hints of raw nuts or avocado. Each substance is fascinating in its own right, though pollen is particularly notable for the transformation it undergoes between its collection and storage. While bees use honey as their primary energy source, pollen is where they derive proteins, vitamins, and other vital nutrients. 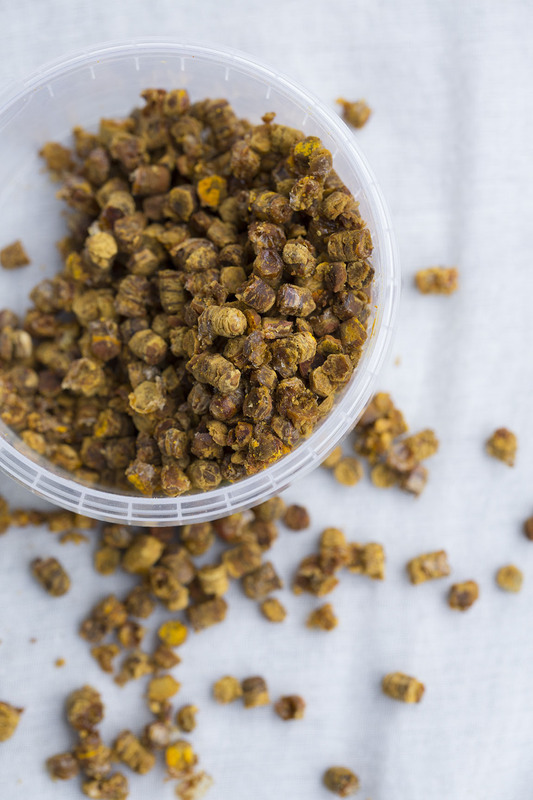 At first glance, bee pollen seems like quite a straightforward product—in the course of pollinating thousands of flowers every day, worker bees are repeatedly showered with grains of pollen, some of which accumulate into granules on the hairs of their hind legs. This is the pollen most commonly available on the market, largely because it is relatively easy to gather using a small device attached to the hive door that knocks the pollen off the returning bees’ legs. Bee bread in comb. Image by Chris Tonnesen. Courtesy of the Nordic Food Lab. Fresh pollen is high in moisture and protein and, especially when brought into the hive—which stays around an internal temperature of 37˚C (98.6˚ F)—becomes an ideal environment for mold growth. The bees’ digestive fluids, however, are rich with lactic acid bacteria (LAB),1 which come to dominate the pollen substrate when it is packed together and sealed from the air with honey. The bacteria metabolize sugars in the pollen, producing lactic acid and lowering the pH from 4.8 to around 4.12—well below the generally recognized threshold for pathogenic microbial growth of 4.6. Bee bread. Image by Chris Tonnesen. Courtesy of the Nordic Food Lab. These LAB come predominantly from the bees themselves, rather than, for example, the plants from which they forage,3,4 and the difference in microbial ecology of fresh pollen vs. stored is great.5 Furthermore, many of the genera which come to dominate fermented pollen are also some of those most common in fermented food products made by humans. In addition to preservation,6 the pollen fermentation process also renders its nutrients more available.2 Some proteins are broken down into amino acids, starches are metabolized into simple sugars, and vitamins become more available.7,8 In this sense, bee bread is even more health-giving than the more commonly available fresh bee pollen. 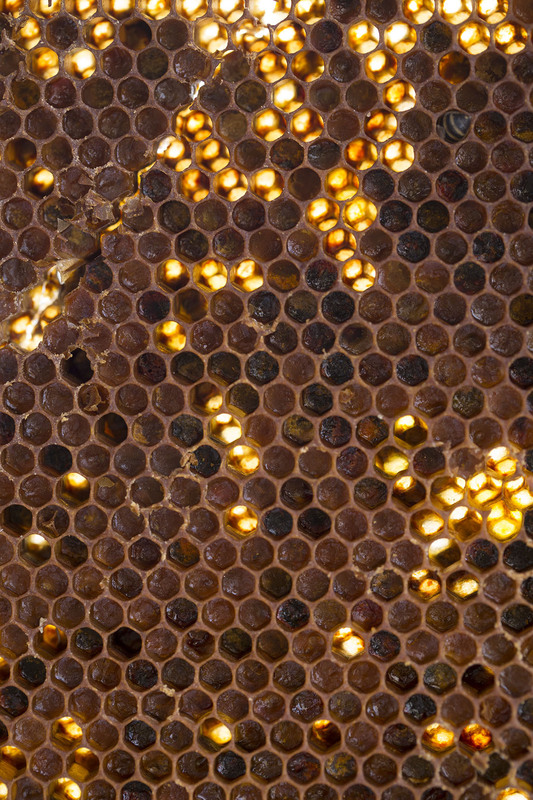 Yet the sensory transformation of the bee pollen into bee bread might be most remarkable. The floral and herbal notes of individual granules become enhanced; the powdery, sandy texture becomes firmer and moister; the acidity from the lactic acid brightens the flavor and tempers possible bitterness; and the fermentation also produces secondary aromas that generate new flavors of fruit—some, for example, gain the distinct taste of mango. The particularities of the fresh pollen, depending on the season and its plant sources, become enhanced, and new qualities that were not present before are revealed. 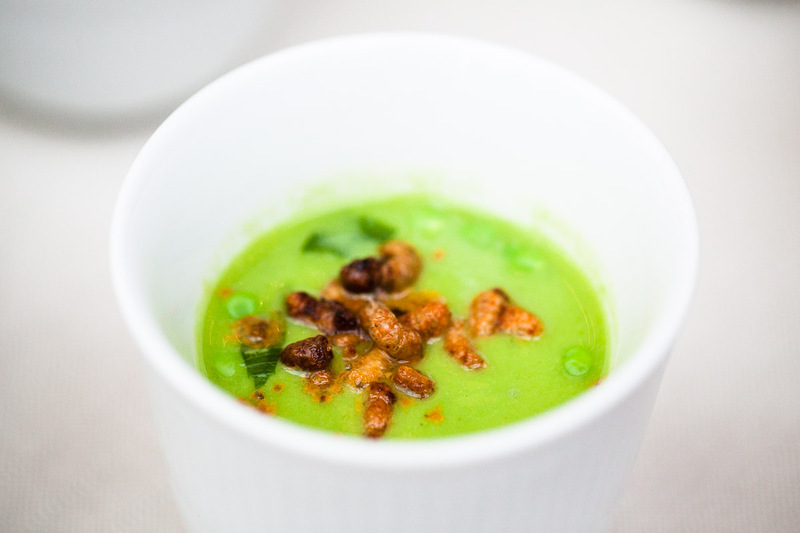 We have used the bee bread in different recipes: ‘Peas ‘n’ Bees,’ a soup of fresh pea juice with bee larvae, some fried until crisp and some blanched with lovage, garnished with fresh lovage and bee bread; or ‘The Whole Hive,’ a dessert of beeswax ice cream, sauce of honey kombucha and bee bread, crystallized honey crisp, propolis tincture and apple blossoms. 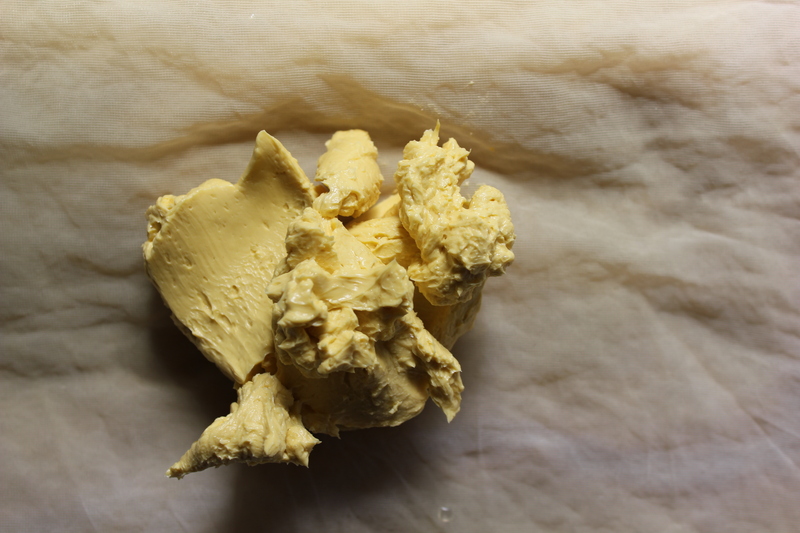 Bee bread is also excellent at initiating the transformation of cream into crème fraîche or butter. Peas n Bees. Image by Jonas Drotner Mouritsen. Courtesy of the Nordic Food Lab. The Whole Hive. Image courtesy of the Nordic Food Lab. Our interaction with Apis mellifera is one of the oldest co-evolutionary relationships between insects and humans—and yet there is still so much we don’t know about the bees. For example, despite the current explosion of interest among scientists to study the complex microbiota of bees, we still do not know exactly which species of microbes drive the transformation of pollen into bee bread, or exactly how. Bee bread butter. Image by Josh Evans. Courtesy of the Nordic Food Lab. Though as fascinating, delicious, and versatile as the bee bread is, my favorite part about it might be the realization that humans are not the only ones who ferment our food. Apis mellifera might have gotten there long before. Bee bread is typically available to harvest throughout the summer months. Ask a local beekeeper for more information. If you’re lucky, they might be willing to share some of this potent, delicious treat. Thanks to Annette Bruun Jensen at the University of Copenhagen for sharing with us a wealth of information about bees and their products over the past few years. Also thanks to Oliver Maxwell and the rest of the team at Bybi in Copenhagen, who have been one of our regular suppliers of both bee brood and bee bread and who go out of their way to help us in our research. To the many more beekeepers we have worked with in Denmark, the Nordic region, and the world: we salute you! 1. Vásquez, Alejandra, and Tobias C. Olofsson. 2009. “The Lactic Acid Bacteria Involved in the Production of Bee Pollen and Bee Bread.” Journal of Apicultural Research 48 (3): 189–95. doi:10.3896/IBRA.1.48.3.07. 2. Mattila, Heather R., Daniela Rios, Victoria E. Walker-Sperling, Guus Roeselers, and Irene L G Newton. 2012. “Characterization of the Active Microbiotas Associated with Honey Bees Reveals Healthier and Broader Communities When Colonies Are Genetically Diverse.” PLoS ONE 7 (3). doi:10.1371/journal.pone.0032962. 3. Gilliam, Martha. 1979a. “Microbiology of Pollen and Bee Bread: The Genus Bacillus.” Apidologie 10 (3): 269–74. 4. ———. 1979b. “Microbiology of Pollen and Bee Bread: The Yeasts.” Apidologie 10 (1): 43–53. doi:10.1051/apido:19790304. 5. Gilliam, Martha, D. B. Prest, D. B. Prest, B. J. Lorenz, and B. J. Lorenz. 1989. “Microbiology of Pollen and Bee Bread: Taxonomy and Enzymology of Molds.” Apidology 20: 53–68. doi:10.1051/apido:19890106. 6. Anderson, Kirk E, Mark J Carroll, T I M Sheehan, and Brendon M Mott. 2014. “Hive-Stored Pollen of Honey Bees: Many Lines of Evidence Are Consistent with Pollen Preservation , Not Nutrient Conversion.” Molecular Ecology, no. 23: 5904–17. doi:10.1111/mec.12966. 7. Degrandi-Hoffman, Gloria, Bruce J. Eckholm, and Ming Hua Huang. 2013. “A Comparison of Bee Bread Made by Africanized and European Honey Bees (Apis Mellifera) and Its Effects on Hemolymph Protein Titers.” Apidologie 44 (1): 52–63. doi:10.1007/s13592-012-0154-9. 8. Herbert, Elton W, and H Shimanuki. 1978. “Chemical Composition and Nutritive Value of Bee-Collected and Bee-Stored Pollen.” Apidologie 9 (1): 33–40. doi:10.1051/apido:19780103. This entry was posted in Events and tagged bee bread, bees, Eating Through Time, food, Food 2015, guest post, Josh Evans, Nordic Food Lab, perga, pollen by nyamhistorymed. Bookmark the permalink.